Market Manila - Lamb Kebabs or Skewers on Muslim Street, Xi’an - Beef/Lamb, etc. The lure of freshly grilled or grilling meat is almost always irresistible. 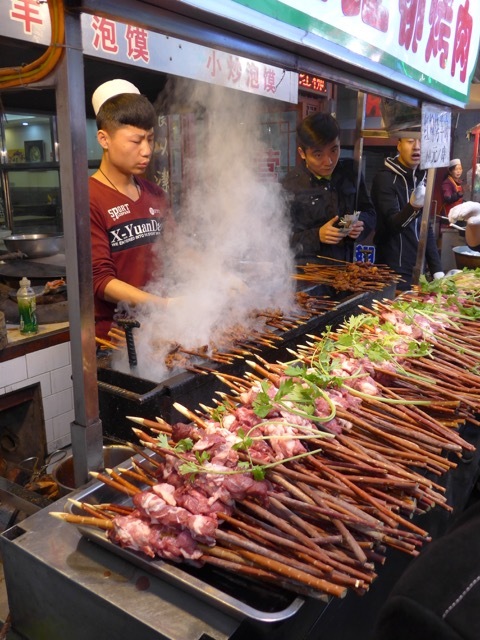 It was no different on Muslim Street in Xi’an, where stall after stall offer local delicacies prepped for the tens of thousands of tourists who walk its length daily. I am told that few if any locals would ever eat here, but this was our first evening, so we were doing the touristy thing. The lines for grilled lamb skewers were often 20-30 folks long, so we took this as a sign of a good thing. 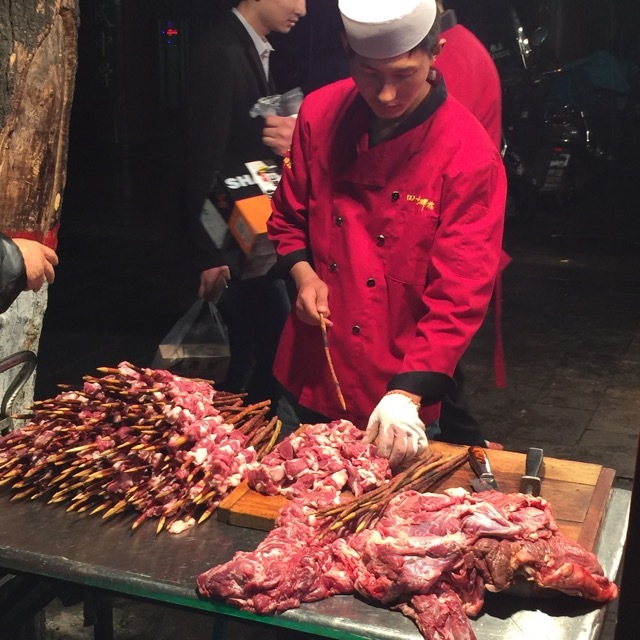 Chunky pieces of mutton are skewered on fresh branches (I never found out from what tree) and grilled over coals. The meat is heavily spiced with cumin, chili, szechuan peppercorns and other spices. It is fragrant, looks terrific and is freshly cooked, all of the hallmarks of to die for noshing. It was NOT particularly good. So long lines are NOT always a good sign. The wooden sticks burn and that doesn’t enhance the meat. The mutton is chewy, tough and fatty, with an occasional bit of cartilage(?) somehow included. The spices were delicious and assertive but they needed much better meat (or a tenderizing marinade), and perhaps a smaller skewer. The same recipe executed on better cut or selected lamb on metal skewer would have been fabulous. So impressed with your up to date posts. Good internet connection! Xian ( as well as the rest of the major cities of China) has come a looong way from when we first visited in the mid 80’s. I don’t remember seeing any street food stalls then but a lot of sidewalk markets, and the terra cotta warriors were just beginning to be unearthed for display. 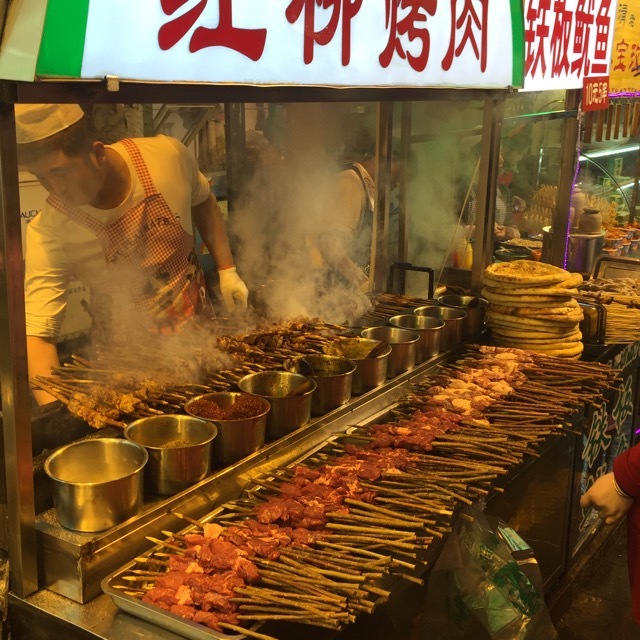 And yes, you won’t get the best grilled mutton in Xian. 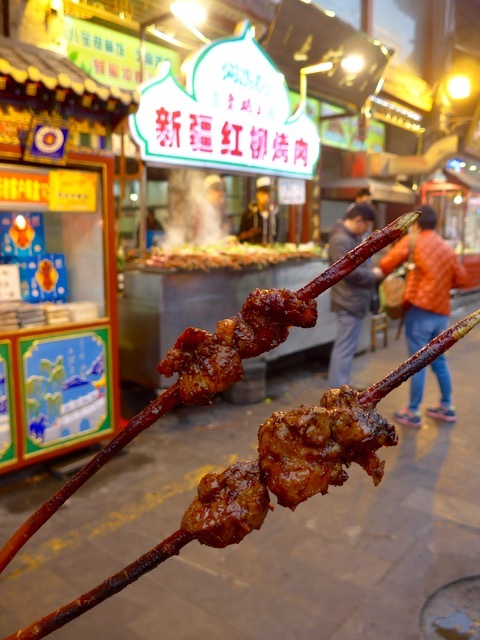 Recurring topic of conversation among ex-pat blogcasts in China that I follow is the absence of food hygiene regulation and enforcement. They were forcibly brought to the 21st century in this regard with the preparations for the 2008 Olympic Games. Now, there are safe and sometimes even organic food sources, but these are often only accessible to members and families of the politburo (and I speculate, the new rich) much like the high mandarinate of dynastic China. Unlike in Taiwan where in spite of the strict enforcement of health regulations, common practices such as preparation of food on the floor level makes my nape hair stand straight. But as you were saying, you are just noshing, not making a daily diet out of it. I read that 10% of the arable land in China is contaminated with heavy metals which is a result of its unbridled mining industry. What this means that the plants grown in this areas could be contaminated with these cancer causing toxins. I just remembered Philex’s dam burst which sent tons of these contaminants downstream. Gina Lopez’s advocacy does have a point. Where did you head next MM? Am sure those skewer sticks are cheaper than bamboo. Or could it be that bamboo is reserved for the pandas?